It may not have been the coldest and snowiest of Canadian winters, but it was still winter. That means scraping ice off your car, driving on salty roads and long stretches where it just isn’t feasible — or at the very least comfortable — getting outside to wash your vehicle. But spring will soon be here and the weather is getting nicer. It’s time to get out into the driveway and get your car or truck ready for the hot months. 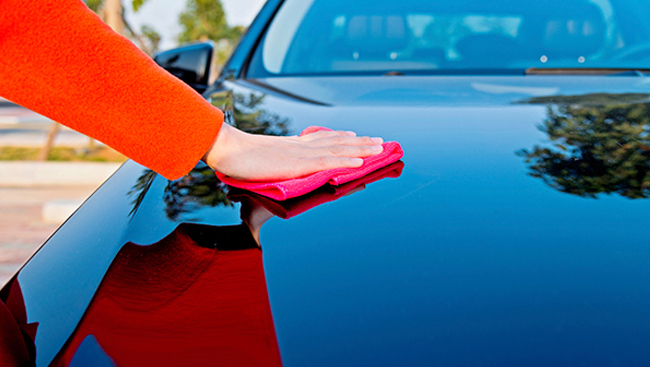 One of your first orders of business is washing the exterior and applying a new coat of wax. While the clear coat — a resin that shields a car’s paint job — adequately protects your car from the elements, it is prone to scratching, swirl marks and collecting dirt. Applying a coat of wax helps preserve and bolster the clear coat while resisting dirt, dust and water; a good wax will make the water bead and run off as well as enhance depth of colour and shine. Back in the day when wax was the protector of your paint, it was a time consuming and cumbersome process. Good news, recent innovations have made waxing a simple step that pays big dividends, with easy maintenance that will help your car sit protected and shiny in summer’s sun right through Labour Day. Here are some tips for waxing and maintaining your car and getting the best results. Wash your car thoroughly. Winter is tough on a vehicle. Give it a good scrub with a car wash and a sponge, ensuring you clean the salt off the undercarriage. Apply your wax. Whether using a paste, liquid cleaner or spray, you want something that is going to restore and enhance your car’s colour, giving it that showroom, high-gloss shine. To make the job easier on yourself, get an easy buffing wax that will not only remove old wax build up but can also be applied to a wet or dry vehicle — saving you the step of drying your car. Keep it shiny. Don’t just leave your newly waxed car to fend for itself against Mother Nature. A full wax after each car wash may not be necessary, but a spray wax is a quick and easy process to touch up faded areas or detail your whole car for a long-lasting shine. Maintain the look. Enhance the wax protection between washing and waxing with ease using a spray detailer that removes dirt residue and leaves behind a high-gloss shine in seconds.